Day 5 of the A Proverbs Wife community Bible Reading Challenge. Today is day five of our 7 Days in Ephesians and if you haven’t already started reading along today’s a great day to start. This is a great opportunity for you to get involved with a community wide study of the Bible. post about what you’ve read for the day and share a link to your site in the comment section. 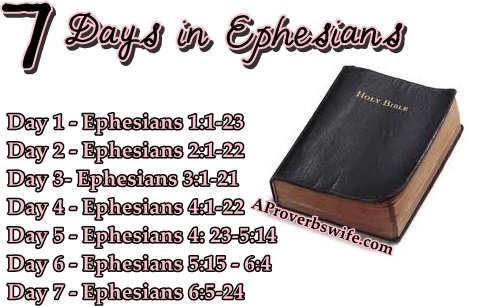 visit other blogs who are participating and gain even more insight into the book of Ephesians. If you write about it on your blog, be sure to add the reading plan image to your post and include a link back here so that others can get involved. The reading plan will be posted 10/22 through 10/29.